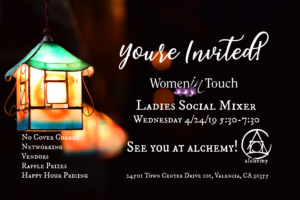 HomeLadies Social Mixer BFF & WiT II – You’re Invited! Our featured vendors for the night will be: ANNOUNCED SOON! In the spirit of our friends from BFF (Be Friends First), Women In Touch is hosting this mixer to keep the fun going. The ladies Social Mixer is open to all women whether you’re a professional, an entrepreneur or you’re simply looking to make friends. We hope to see you all there! Great, affordable food & drink is available for purchase on the Alchemy Valencia menu at Happy Hour Prices during the whole event. A one drink minimum is suggested to support our venue, as there is no cover charge for this event and Alchemy has graciously provided the space for us. We hope to support them as much as possible.